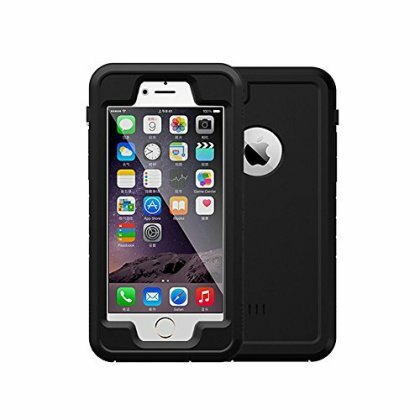 *Rugged Protection -This iphone case provides a full waterproof, snowproof, shockproof, dustproof, and anti-scratch protection for your iPhone, Up to IP68 Waterproof Certified and you can submerse your iphone 6/6s in 6.6 ft/2 meter water for 31 minites,§­?§­?§­ ?§­?§­?§­ture, you can take it go swimming, surfing, snorkeling, boating, kayaking. *Full Functionality -Precise cutouts offers a easier way to access to all buttons and openings, such as power, volume, charging, headphone jack, home button (Fingerprint ID), mute, speaker, camera, flash and etc. Rugged and all-sealed design will survive your phone from drop at a height of 2m/6.6 feet. *Touch ID Compatible -Built-in high clarity screen protector that works with Touch ID and protect the screen from scratch and damage. Super high sensitivity or clarity. Easy access touch screen means taking pictures, texting, calling, or recording videos is a snap! *Made of high quality TPU + PC material, the most durable and slim waterproof case designed for iPhone 6/7s is perfect for outdoor use when you are diving,hiking, running, climbing, swimming, surfing, snorkeling, boating, etc. *Package Includes-Waterproof case, Cleaning Cloth, Lanyard, User Manual (Pls read it carefully). Please not it only fits for the iPhone of non-Glass Screen Protector, or will affect the touch sensitivity, or would destroy the tightness of case.